Here’s a serious topic today. Michael Vick has been released from federal prison. Vick has spent the last 19 months in prison for his role in a dogfighting ring. Lucas, who was one of Michael Vick's dogs. Lucas has been rehabilitated by Best Friends Animal Sanctuary. ESPN reports: Vick has said he wants to work with the Humane Society on a program aimed at eradicating dogfighting among urban teens, society president Wayne Pacelle said Tuesday. Pacelle said he recently met with Vick at the federal prison in Leavenworth. Vick requested the meeting, one of his attorneys, said. The former Atlanta Falcon was charged in 2007 with dogfighting conspiracy. The court case revealed gruesome details of how Vick’s Virginia-based operation treated pitbulls. Authorities found dogs, some injured and scarred, chained to buried car axles. Forensic experts discovered remains of dogs that had been shot with a .22-caliber pistol, electrocuted, drowned, hanged or slammed to the ground for lacking a desire to fight. Now as repulsive as Mr. Vick’s actions were I’m afraid that I find the Humane Society of the United States’ actions pretty disgusting right now. It may be cynical, but I think we can all guess that Mr. Vick is probably trying to salvage his career. He lost a contract with the Falcons worth $130 million plus untold endorsement possibilities. If ever there was someone in need of some positive publicity, it’s Michael Vick. Has he learned his lesson? There’s no way to know. Has he had a change of heart where dogs are concerned? We just don’t know. But I don’t think that anyone who cares about animals should ever trust him with one again for the foreseeable future. But for HSUS to latch on to Vick as a way to raise more money is about as low as you can go. It makes you wonder if there’s anything that they won’t do to raise money. 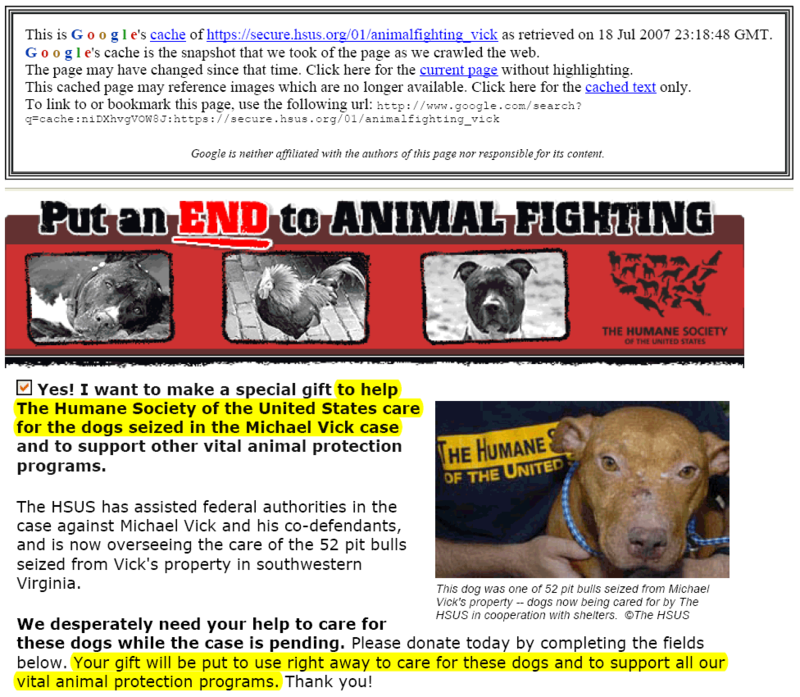 For context you have to remember that HSUS is the organization that went to work raising money to care for the Michael Vick dogs as soon as the dogs were seized in 2007 — only it was soon revealed by the New York Times that HSUS did not actually have custody of the dogs. They weren’t caring for the dogs at all or paying for their care. They had simply been using the sympathy for those poor animals as a way to raise money for their organization. They quickly adjusted their pitch and started raising money to fight dogfighting instead. Pacelle said the Humane Society normally advocated that fighting dogs be put down shortly after being seized. Thankfully, real dog experts convinced the court that the dogs could be rehabbed and the dogs were dispersed to people with the experience to work with them. Many of the dogs have since gone on to live very happy lives since that time. So, now HSUS wants to go back to Vick again to try to raise more money from this tragedy? I call that morally reprehensible. Regardless of what HSUS claims they would do with the money, the false pretenses involved in raising the funds are just too damning. The Humane Society of the United States was recently investigated by WSB-TV (ABC) in Atlanta. You can read a transcript of that report, which was highly critical of HSUS, at PetPac.net.